Чаҵә Чагә еицырдыруаз жәлартә сатирикын, лафҳәаҩ дуун, жәабжьҳәаҩын, жәытә ҭоурыхҳәаҩын, аиаша иашьҭаз уаҩын, Аҧсни аҧсуареи зыгәҭыхаз иакәын, быжь бызшәак идыруан. «Чаҵә Чагә ихҭысқәа» – иара изкны жәлар ирҳәаз, иахьагьы еиҭарҳәо ажәабжьқәеи, анекдотқәеи, аиҭаҳәахәҭақәеи реизга шәҟәуп. Урҭ анҵаны еизган 1954 – 2005 шықәсқәа рыҩнуҵҟа. Хаз шәҟәны раҧхьа иҭыжьын 1983 шықәсазы, нас урысшәала, 1990 шықәсазыҳәан. Ари аиҭаҭыжьроуп, иацлақәазгьы маҷым, урҭ рыӡбахә ашәҟәы анҵәамҭан иара Чагәи уи ихҭысқәеи рыхцәажәараҿ иҳәоуп, дара зҳәамҭақәоугьы рыхьӡынҵа, акомментари аҟны иарбоуп. Чаҵә Чагә изкны ирҳәо, абра иану ажәабжьқәа ирыҧхьо дааҧсаны дыҟазаргь, иҧсы идыршьоит, аччара шыхәшәу, уаҩ иқәра ишацнаҵо здыруа рзы, иззымдыруа рзгьы, ибзиоуп. Chagu Chatsba or as he was called among people - Chats Chagu was a favorite of people, a hero the Abkhaz folk humor, a popular satirist, a truth under and a story teller of old Abkhazian legends and stories as well. «Adventures of Chagu Chatsba» is a collection of popular stories about adventures and amusing tricks of Chagu Chatsba. It is the book of laugh, adventures, folk wisdom and history of people. It is simply the book of rest. 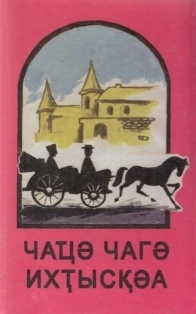 The first edition of «Adventures of Chagu Chatsba» in Abkhaz was published in 1983. At present, the second additional publication includes 12 stories such as: « Chats Chagu is in Lykhnyaschta», «Chats Chagu is in Mokuaschta», «Tsar’s name, or name helped», «Advice for those who want to learn in their mother tongue», «Chats Chagu and Gogua Nocha», «Chagu and Nocha. Continuation. Or how to establish contact with the Red Pyramid». «Adventures of Chagu Chatsba» was written down by me in 1954-2005 without support of the state. The book includes afterwords and classilled comments to the stories. I hope, that it will rouse interest of scholars-Abkhaz and Adygean folk ethnographers and also those who put obstacles during writing down and collection of the material and publication of it both in the Abkhazian and Russian languages.